Corsair was relatively quiet at the start of CES this year, but it didn't attend the convention empty handed. 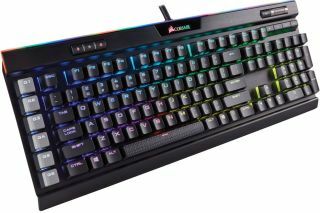 Apparently it was just waiting for the initial wave of news to die down, because today it unveiled several new products, including a new flagship mechanical keyboard (K95 RGB Platinum) and a Pro version of its Scimitar RGB mouse with a dozen side buttons. The K95 RGB Platinum plops the user's choice of Cherry MX Speed or RGB Brown key switches atop an "aircraft-grade" anodized brushed aluminum frame that Corsair says is lightweight and rugged. It's a full-size keyboard with a number pad, six textured and programmable G-keys for in-game macros, and dedicated media controls. The big new additions that Corsair is promoting with this keyboard are hardware playback and 8MB of onboard memory. This allows gamers to save not just custom key assignments and macros to memory, but also more complex and multi-layer reactive profiles without the need for external software. "Set up profiles and custom key assignments for three onboard profiles in Corsair Utility Engine (CUE), save them to memory, and then use the K95 RGB Platinum with all your custom lighting and key controls on any system," Corsair says. The keyboard comes with textured and contoured FPS and MOBA keycap sets. Other features include 100 percent anti-ghosting with full key rollover, USB 2.0 pass-through, and a detachable, dual-sided soft-touch wrist rest. Corsair says the K95 RGB Platinum will be available later this month in choice of black or gunmetal anodized finishes (gunmetal will only be available in North America with Cherry MX Speed switches). A price has not yet been determined. Corsair's Scimitar Pro RGB is based on the same 12-button design as its non-Pro predecessor and adds onboard profile storage and a native 16,000 DPI PMW3367 optical sensor that it developed in partnership with Pixart. Based on the name, we're guessing it's based on the fantastic PMW3366 that Logitech developed with Pixart and uses in most of its gaming mice, and is widely considered the best around. Corsair says games can adjust the DPI in single increments through its CUE utility for ultra-accurate and high-speed tracking. The mouse is also capable of tuning its sensor for optimal performance on just about any type of surface, which is also performed through CUE (it has a surface calibration tool). There are 17 buttons in all, each of which can be fully remapped and/or programmed with macros and saved to onboard memory. As for the 12 side buttons, users can reposition them up to 8mm using Corsair's patent-pending Slider system. The Scimitar Pro also supports four customizable RGB lighting zones. These can be saved directly to the mouse, which allows a user to retain the same settings on any PC without having to install any special software. Corsair's Scimitar Pro is available now for $80 in choice of black of yellow.